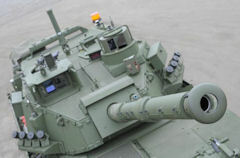 CMI Defence is the undisputed technological leader in multifunctional, high-power weapon systems for light and medium armoured vehicles. With the strength of its cutting edge expertise in software, ballistics and electro-mechanical engineering behind it, CMI Defence designs and integrates new gun-turret systems and modernises weapon systems already in operation. The systems which are designed, integrated or modernised by CMI Defence benefit from an electronic architecture which confers on them a degree of modularity without rival on the market. The highest calibres can also be used as missile launchers. They are suited to a wide range of wheeled or tracked carriers and are applicable to the 25 to 120 mm calibre range. CMI Defence also provides advice in the use of these systems. The combination of all of these solutions guarantees optimal performance from the systems throughout their life-cycle. CMI Defence is independent of any and all vehicle manufacturers. It sets itself apart through the efficiency of its technological innovations, oriented towards the constantly evolving operational needs of armed forces. The CSE90 Weapon System is the latest evolution of the CM90 turret equipped with the famous Cockerill Mk3 90 mm low pressure gun. Light and compact, with a low recoil, the LCTS90 Weapon System fits most light armoured vehicles available on the market, tracked or wheeled. Thanks to the powerful Cockerill Mk8 90 mm gun, it gives them similar anti-tank capabilities as heavier tanks using 105 mm weapons without penalizing their mobility or transportability. The CT-CVâ„¢ Weapon System represents the fusion of cutting-edge technology and proven weapon design. The advanced 105mm turret integrates state-of-the-art technologies so that it provides a credible and effective direct fire solution for any light/medium armoured wheeled or tracked vehicle. Cockerill Medium Calibre Weapon System CMI Defence's experience and technical expertise in integrating cutting-edge multi-functional weapon systems into lightweight air-transportable armoured vehicles provides CMI Defence with a unique capability: integrate all types of medium calibre guns (25-50 mm) into turret systems that make full use of CMI Defence's proven modules and technologies developed for its large calibre CT-CVâ„¢ and LCTS90 Weapon Systems.